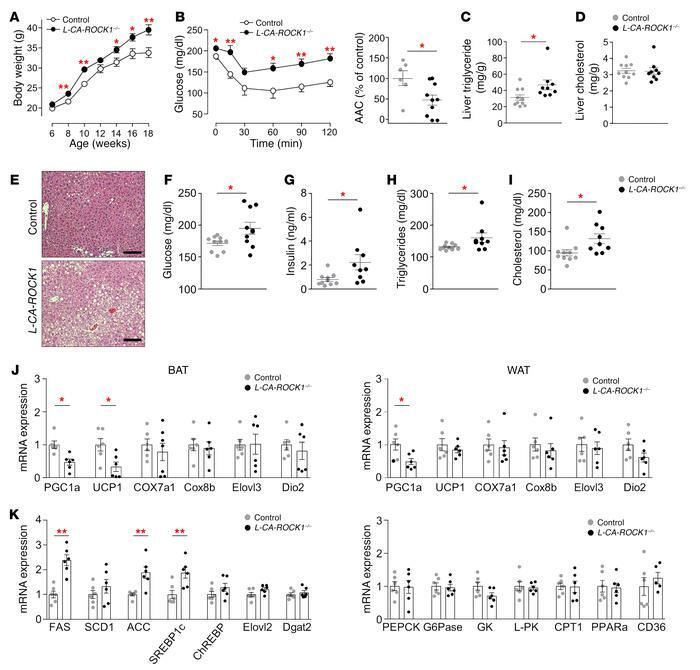 Hepatic ROCK1 activation accelerates adiposity, insulin resistance, and hepatic lipid accumulation. Body weight (n = 11−12 per group) (A), blood glucose during ITT (14 weeks of age, n = 6−10 per group) (B), liver triglycerides (C), liver cholesterol (D), H&E-stained liver sections (n = 3 per group) (E), random blood glucose (16 weeks of age) (F), serum insulin (G), serum triglycerides (H), serum cholesterol (I), thermogenic gene expression in BAT and epididymal WAT (n = 5–7 per group) (J), and gene expression of key molecules involved in lipogenesis, gluconeogenesis, glycolysis, fatty acid oxidation, and uptake (n = 5–7 per group) (K) were measured in CA-ROCK1 (control) and albumin-Cre;CA-ROCK1 (L-CA-ROCK1) mice fed an HFD. Mice were fed an HFD from 6 weeks of age. Serum and hepatic parameters were measured from overnight-fasted mice at 18 weeks of age (n = 9−10 for group). Thermogenic gene expression was measured from overnight-fasted mice at 18 weeks of age. Scale bars: 100 μm. Values are means ± SEM. *P < 0.05 vs. control, **P < 0.01 vs. control by unpaired Student’s t test.